Ryan Burnett is entering the most important month of his fledgling professional career. The Belfast bantamweight will fight Gagi Edisherashvili - who is hoping to overcome visa difficulties to face Burnett - for the WBO European title in Manchester on Saturday night before taking on Jason Booth for the British bantamweight title in London on November 23. Winning both these titles in such a short space of time would catapult Burnett up the rankings after 12 fights as a professional. Much has been talked and written about Burnett ever since he won gold at the junior Olympics in 2010, along with a silver at the World Youth Championships in the same year. And now after ten fights as a professional, he is about to get himself in the title mix, as has won all of his ten professional fights to date with eight of those wins coming by way of knock-out. And Burnett cannot wait to fight for his first title on Saturday night. ‘I am looking forward to the fight as it is a big opportunity for me to progress my career and win a title. “I have trained really hard for this fight and I intend to be the new WBO European Bantamweight Champion come Saturday night. “My opponent is a tough guy and he is coming to win, so I know I have to perform on the night if I want to get my hands on the belt, and then get my head down again for that shot at the British title, but all I am focused on now is Saturday night,” added Burnett. And Burnett - who started his career under former World Champion Ricky Hatton - says his trainer Adam Booth has brought so much to his boxing. 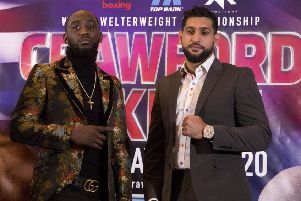 “He has made me feel more comfortable with my style and I thought I knew about boxing until I started training with him and then I realised I knew very little about boxing. So it has been very in good for my development to be working with him,” he added. And Burnett’s trainer Booth believes this is Burnett’s time to show what he can do. “Ryan is a very talented and skilful fighter and is well prepared to challenge for his first title belt. In training we have built a good foundation and now is the time to step things up a level. Ryan is a very focussed and determined boxer, who listens and learns quickly.